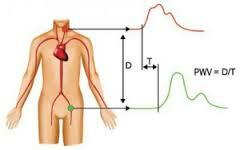 Central blood pressure (BP) is the pressure in the aorta, which is the large artery into which the heart pumps. The term ‘central BP‘ usually refers to the pressure in the aorta near the heart. The stiffness of the aorta and other major arteries is related to central BP; the stiffer the artery the higher the central BP. 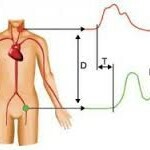 Pulse wave velocity (PWV) is a measure of arterial stiffness. Higher central BP and arterial stiffness means that the heart must work harder. This can eventually lead to heart failure. Central BP also determines the pressure in the blood vessels feeding the brain. If central pressure is too high, it may cause aneurysms and strokes. Central pressure and PWV have been shown to more strongly relate to vascular disease and outcome than traditional upper arm BP. Central BP can also distinguish between the effects of different hypertension medications when upper arm BP does not. Until recently measurement of central BP and PWV has involved specialist equipment, settings and experienced technicians. However, a growing number of devices now allow measurement of central BP and PWV using an automated device and a modified blood pressure cuff. These devices appear to give valid measures and present the opportunity for the first time to measure central BP and PWV in primary care. I am currently involved with a number of projects utilising automated measures of central BP and PWV including chronic kidney disease and young adults with increased risk of cardiovascular disease and patients with heart failure. Collaboration with a department study assessing chronic kidney disease management in primary care (OxRen) will look at the relationship between central BP and PWV to disease progression. These measures could lead to a more accurate phenotyping and targeted treatment in chronic kidney disease, leading to better outcomes. The body of work as whole will help to establish the role of central BP and arterial stiffness in the management of cardiovascular and other related conditions within primary. Performance of pulse wave velocity measured from a brachial cuff in a community setting. Nunan et al. Submitted to Blood Pressure Monitoring March 2014. Assessment of central haemondynamics from a brachial cuff in a community setting. Nunan D et al. BMC Cardiovascular Disorders. 2012; 12:48. Estimating central blood pressure and arterial stiffness in primary care using non-invasive automated pulse wave analysis. Nunan et al. Horizon Scan Report 0014; 8 June 2011.